Airlite Plastics Co., an Omaha-based EPS molder has acquired Formtech Corp. The takeover, finalized in early January, is the first for Airlite, which is best known in this industry for its Fox Blocks brand of ICF. With Formtech, Airlite can now offer a knock-down panel ICF to complement its existing line of forms with a fixed tie design. The new product line will operate as an independent company under the name Formtech LLC. Formtech was founded in 1996 as a private company by Frank Bentley, and was one of the first dozen companies on the market. Formtech found a niche with a system that ships flat, offers multiple-width cavity sizes, and provides the assurance that comes with certified resins in both EPS and plastic components. Airlite Plastics Co. is a plastic injection molder specializing in a variety of foam and plastic products. 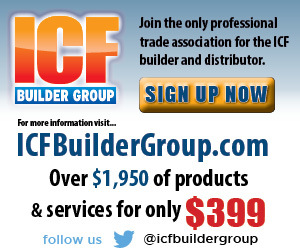 It was one of the early manufacturers of ICF construction blocks, and now produces roughly 1.6 billion molded units annually. 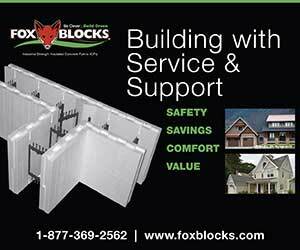 In an effort to integrate the PolySteel and Eco-Block product lines more fully, Arxx Corp. has rebranded its entire line-up of ICFs. Since acquiring the two companies in the summer of 2008, Arxx has been struggling to maximize the synergies of the purchase. The old PolySteel form will now be called Arxx Steel, and the knock-down Eco-Block is now Arxx Edge. The well-known exposed-tie Arxx block is Arxx Classic. The company, under a new management team, is retreating from the model of being a one-stop-shop for all green building materials, and is focusing instead on its core strength of selling ICFs through the established distributor networks. Uniscaffold and Apex Block, once part of the company, have been spun off or sold. With the new trade names of Arxx Steel, Arxx Edge, and Arxx Classic, this venerable ICF brand hopes to take its place among the industry leaders. Hubert Max Kustermann, a leading ICF executive who has shaped this industry for more than a decade, has stepped down as president of Quad-Lock. The company states that Mr. Kustermann has decided to return to Germany with his family and pursue other business interests. Until a permanent replacement is found, Hubert Max will be replaced by his brother, Georg Kustermann, effective immediately. During his tenure at Quad-Lock, Hubert Max created a national distributor network and several significant product innovations, such as the R-ETRO system, the Plus Panel, and the full-height furring strip. In addition to his work at Quad-Lock, he has played an integral role in the Insulating Concrete Forms Association, spending more than a decade on the board, and serving as its chairman from 2003-2005. His current seat on the ICFA board will remain unfilled. This magazine, along with the rest of the industry, extends thanks to Kustermann for all he has done to take ICFs into the mainstream, and wishes him health, success, and happiness as he embarks on the next phase of his career. Donn Thompson, has been named the director of low-rise buildings at the Portland Cement Association (PCA). With this promotion, he will encourage the use of cement-based products in both residential and low-rise commercial construction, as well as coordinate the efforts of other allied associations. Thompson will continue his active role in the National Association of Home Builders Concrete Home Building Council. Thompson has more than 20 years of design and construction experience, and is a licensed architect and has LEED-AP credentials as well. Prior to working at the Portland Cement Association, he worked at Reward Wall Systems. 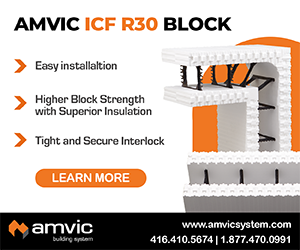 Wind-lock recently began distributing a masonry anchor developed specifically for use with Insulated Concrete Forms (ICF). The tieKey anchor is an easy-to-install masonry tie anchor that can be used for projects requiring brick or natural stone facing over ICFs. Stamped from 16 gauge steel, the tieKey has been tested for tension and compression strength by an independent laboratory to verify its capacity to resist lateral loads. For more information, visit www.wind-lock.com. The “Watercress Project” in Pentwater, Michigan has been certified Platinum under the LEED-Homes criteria. This is the highest honor you can receive from the USGBC. The home was built by Adam Bearup of Hybrid Homes, the same construction team that built the highly-publicized Onekama Home two years ago. 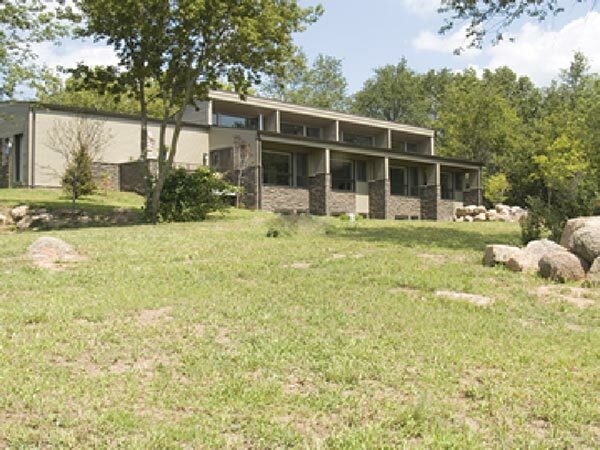 The Wellhouse in Waupaca, Wisconsin sets a new standard for affordable, durable, sustainable concrete homes. It is built using Insulated Concrete Forms (ICFs). Designed by Ken Dahlin of AIA Genesis Architecture, LLC, and built by John Durrant of Elm Valley Carpentry, it was built for roughly $100/sq. ft. \ In addition to ICF walls, it uses concrete flooring, radiant in-floor heat, and a state-of-the-art HVAC system to minimize energy use. The exterior is finished with cement-board siding. Lubbock, Texas boasts the most successful ICF low-income home construction program in the U.S. For more than a decade, the city has used Federal grant funds to build 120 ICF homes in Lubbock for low income families. The new homes are energy efficient, with monthly heating bills of $70 to $80, rather than the $400 per month for the substandard housing they replace. Now the program is getting national attention. To highlight the program’s success, the National Community Development Association (NCDA) Southwest Region hosted it annual meeting in Lubbock, attracting 50 public housing officials from more than 30 Southwestern U.S. cities. NCDA is an organization of local governments that administer federally-supported community, economic development, and housing programs across the country.